As Israel launched fresh bloody attacks on the 1.8 million Palestinians in the besieged and occupied Gaza Strip, supporters of the international boycott, divestment and sanctions (BDS) movement continue to take inspiring action and pile pressure on governments to impose a military embargo and other sanctions on Israel. Thousands of supporters of Palestinian rights in the San Francisco Bay area have taken part in pickets and demonstrations that have prevented an Israeli ship from docking at the port in Oakland for four consecutive days. 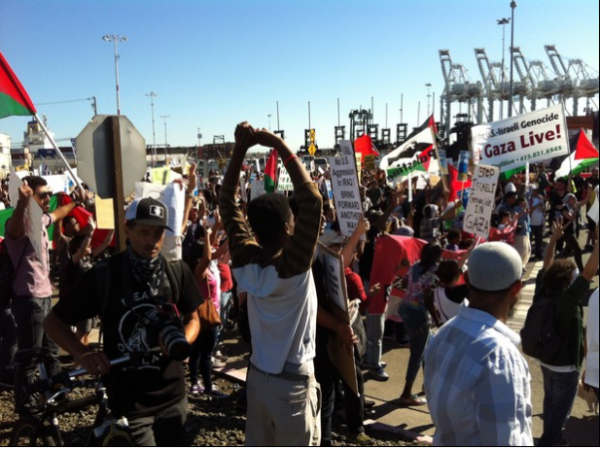 The action, taken in response to a call from Palestinian trade unions in Gaza, prevented the Zim Pireaus ship from docking at Oakland entirely, and lasted for four days, forcing the ship to leave the port of Oakland without being unloaded. Dockworkers from the local International Longshore Workers Union (ILWU) - Local 10 honored a community picket line, and refused to unload the ship. “The hugely successful action in Oakland is an inspiring and effective display of solidarity by the community and workers of Oakland that has the potential of causing real damage to Zim, Israel’s biggest shipping company, and eventually to the Israeli economy as a whole,” said Mahmoud Nawajaa, the general coordinator with the Palestinian BDS National Committee (BNC). “The accelerating growth of BDS around the world is the most appropriate first response to Israel’s massacre in Gaza. Ending Israel’s criminal impunity starts with grassroots actions that can pressure governments to act,” Nawajaa added. The Oakland action follows weeks of huge mobilisations in support of Palestine, including an international Day of Rage for Gaza initiated by groups in Gaza that saw hundreds of thousands of people take to the streets to call for a boycott of Israel and demand governments impose sanctions and a military embargo on Israel (photos here, here and here). “The global masses that demonstrated their support for Palestinian rights on the Day of Rage, remind us of the demonstrations in the 1980s against apartheid South Africa,” wrote Haidar Eid, a Palestinian academic, community leader and BDS activist based in Gaza. A dramatic deterioration in EU-Israeli trade relations has taken place, with the European Commission informing Israel that it intends to “completely ban the import of milk and dairy products from Israel, which may be in any way related to factories, dairies or farms located beyond the Green Line,” the Israeli daily Maariv reported. “This decision is an important step forward, bringing EU policy and accountability measures towards Israel more in harmony with the BDS logic that products of any company with connections to the illegal Israeli colonies in the occupied Palestinian territory must be banned entirely,” said Michael Deas, Europe coordinator with the BNC. “But these new moves still appear to rely on the EU trusting the word of Israeli exporters that have been shown to employ routine deception about the origin of their produce and do little to address the huge support that the EU affords to Israel despite its regular massacres of Palestinians. The EU must ban all trade with companies that operate in settlements and take steps to suspend its Association Agreement with Israel,” added Deas. A call for a comprehensive military embargo on Israel has been a key demand of Palestinian civil society in the wake of Israel’s attack on Gaza. Six Nobel laureates and more than 90 public figures have called for a military embargo on Israel, a call that has been echoed by civil society groups, political parties and parliamentarians across the world. The BDS National Committee is urging people to add their names to a public petition for a military embargo that will be submitted to the UN General Assembly. In a sign that calls for a military embargo are becoming increasingly mainstream, Amnesty International has built on its call for a military embargo on Israel by urging the US government to block a shipment of fuel destined for use by the Israeli military. Oxfam International has also issued a call for an end to arms sales to Israel. Bolivian President Evo Morales, Fidel Castro and a series of other high-profile figures from central and Latin America have called for BDS action and government sanctions, in a powerfully worded statement. The statement follows the recalling of ambassadors by 5 Latin American countries and the suspension by Chile of negotiations on a free trade agreement with Israel. A coalition of Chilean MPs from different parties has started a parliamentary petition asking the government to stop all acquisition of Israeli arms. Chile is one of the top 10 importers of Israeli weapons globally. In Brazil, the Minister of Defense, Celso Amorim, is being called upon to clarify all current military contracts with Israel as well as the ongoing presence of Brazilian military attachés in an office of the Brazilian armed forces in Tel Aviv. Defying Palestinian and Amnesty International appeals for a military embargo on Israel, the German government, reports revealed, exported a heavily-subsidized military submarine with nuclear capability to Israel in the middle of its ongoing war crimes and crimes against humanity in Gaza, making Germany the second most complicit government in Israeli crimes after the US. To its shame, the UK government has made announcements suggesting that it will continue to arm Israel. Campaigners had hoped that the resignation of a key government minister and calls for an end to arms sales to Israel by deputy prime minister Nick Clegg would force the government to impose a military embargo. - The executive of the UK National Union of Students, representing 7 million British students, passed a motion in support of BDS campaigns. - Midlothian has become the fourth Scottish council to endorse BDS, following earlier decisions by Clackmannanshire, West Dunbartsonshire and Stirling. - Major Israeli food exporters are facing an unprecedented wave of cancellations in orders from Europe as a result of Israel’s most recent massacre of Palestinians in Gaza, it has emerged. SuperValu, the biggest food distributor in Ireland, told the Irish media last week that it has withdrawn Israeli products from its shops and a silent boycott of Israeli produce is increasingly being adopted by major European retailers, according to the Israeli business press. - Factories owned by Israeli arms company Elbit Systems have been occupied by activists in Australia and the UK, with the UK factory forced to close for two days. The UK activists that occupied the Elbit Systems factory have been charged with aggravated trespass, but have plead not guilty in court on the grounds that Elbit’s activities in arming Israel are themselves illegal. - UK superstar comedian Russell Brand has released a video denouncing Barclays complicity with Elbit Systems and backing the 1.6m strong Avaaz petition calling for divestment from companies that arm Israel and participate in its violations of international law and . Brand is the latest in a long list of celebrities that have spoken publicly in support of Palestine in recent weeks. - The Argentine confederation of Trade Unions CTA has called on the government to suspend the Free Trade Agreement between the Mercosul regional bloc and Israel and is spearheading an initiative among trade unions from the region for a joint effort calling for the suspension of the agreement. - Irish and Leinster rugby star Gordon Darcy took part in a protest with 2,000 people supporting the people of Palestine. His Exchequer Bar was one of the first in Ireland to ban the use of Israeli products.